California’s next Section 1115 Medicaid Waiver, Medi-Cal 2020, was approved on December 31, 2015. The Medi-Cal 2020 initiatives include a Global Payment Program, a Whole Person Care Pilot program, a Dental Transformation initiative and the introduction of the Public Hospital Redesign and Incentives in Medi-Cal program (PRIME). PRIME builds upon the successes of the Delivery System Reform Incentive Payment Program (DSRIP) established under the 2010 Bridge to Reform waiver, continuing to encourage a transition to value-based care as it enters Demonstration Year (DY) 11. The waiver strives to further expand access, improve quality of care and outcomes, and control the cost of care. The PRIME demonstration approved through December 31, 2020 is available to eligible designated public hospital (DPH) systems, as well as district municipal public hospitals (DMPHs) and contracted providers. Incentive funding is available to eligible entities based upon successful performance on a designated set of core metrics. PRIME pool funding will not exceed $7.464 billion over five years, of which $1.4 billion will be available annually to DPHs and $200 million to DMPHs during DY11-DY13. Participating health systems will incur a phase down in the final two years with a 10 percent decrease in funding during DY14, and a 15 percent decrease in DY15. The PRIME program emphasizes similar objectives from the previous demonstration to improve access to coordinated care and quality of care provided. 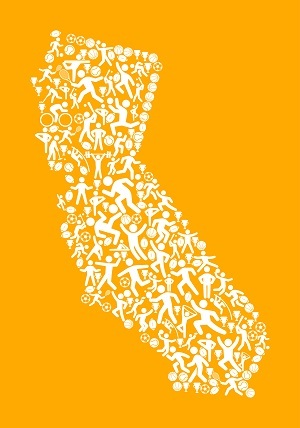 Focus on addressing overall needs of Medi-Cal beneficiaries through DHCS-approved target populations for each project. Promote integration of health care settings by aligning care across a spectrum ranging from inpatient services to community-based settings in an effort to encourage care coordination for at-risk populations. Transition from fee-for-service model to alternative payment models in DPHs by the end of the demonstration period. Payment for performance based on PRIME project metrics. Entities will be responsible for demonstrating successful implementation of projects and improvement over a baseline in both mid-year and final year reports on their defined population’s health and health care outcomes. PRIME differs from the previous DSRIP model with a completely new menu of projects dispersed across three domains focused on outpatient services, targeted populations and resource utilization. By requiring the use of standardized metrics, it incentivizes implementing industry best practices that can be reported consistently across California. The demonstration’s project menu organizes available projects in three domains that focus on driving quality improvements. DPHs are required to implement a minimum of nine PRIME projects spanning all three domains. Due to their smaller size and first year of involvement, DMPHs are only required to choose at minimum one project to participate. Additionally, DMPHs have the option to submit a joint application with other DMPHs to further care coordination. Project metrics are standardized for each project to produce consistent data reporting for comparison throughout the demonstration. Domain 1 offers projects that incentivize providing primary and preventative care in a time-efficient, cost-effective manner. This menu emphasizes a focus on behavioral health, redesign of the ambulatory care setting, and high-impact clinical conditions. Domain 2 emphasizes improved care for populations that would benefit most from care coordination such as individuals with chronic disease or chronic pain. It additionally incentivizes programs for populations with unique needs including foster children and previously incarcerated persons. Domain 3 encourages health systems to become leaders in the utilization of valuable resources including antibiotics, high cost imaging, pharmaceuticals and blood products. Projects focus on improving effective and beneficial use of resources as well as cultivating more consistent diagnostics and treatment to reduce variation in services. Following the approval of the PRIME protocols, participating entities will have 30 days to submit for review their completed Five-year PRIME Pool Plan to DHCS. Project applications will need to demonstrate the capacity to build sustainable infrastructure during the demonstration period through the use of PRIME projects in a specified population of Medi-Cal beneficiaries. 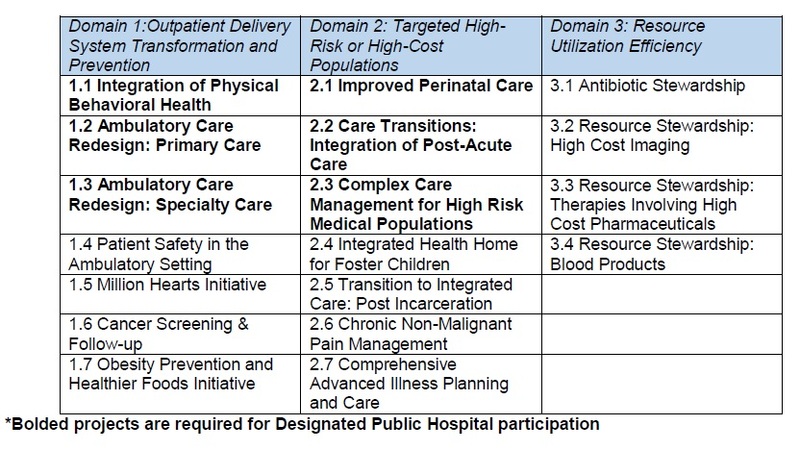 Health systems will indicate plans to implement the requirements for each domain as well as their corresponding metrics. Following submission, DHCS will review the application within 60 days. The PRIME Plan will include participating entity information, an executive summary, a narrative on the plan, project selections, demonstrated understanding of the project metrics, payment amounts and a signed certification statement. Before preparing the PRIME Plan it is important to carefully consider the health system’s current performance on the project metrics. Funding is given based upon successful achievement and measurement of these metrics and it is therefore imperative that project selections reflect metrics within reach. Additionally, participants will need to provide baseline data during the first demonstration year. Keeping this in mind, it is necessary to consider the infrastructure that will be needed to carry out both the projects and their reporting. COPE Health Solutions has extensive experience in 1115 Medicaid Waivers and DSRIP, from planning stages to implementation of projects and development of successful contracting and funds flow strategies. We can assist your organization develop a successful DSRIP strategy to ensure success and integration with the changes to the VBP environment. Our team is well positioned to assist your organization develop and implement best practices in managed care, population health management, Medicaid redesign and Medicaid waivers. For more information about how COPE Health Solutions is helping clients across develop and execute successful contracting and funds flow strategies that align with the shift to VBP contracts, please contact: dsrip@copehealthsolutions.com.